Hay House Inc., 9781401949709, 312pp. Improve your health with clean, natural foods and nutrient-rich recipes that can be made in 10 minutes or less! Liana Werner-Gray understands how hard it is to find the time to take care of yourself; to keep up with her fast-paced life, she indulged in processed convenience foods until she landed in the hospital and could no longer take her health for granted. She shared her journey to healing herself in her blog, The Earth Diet, which launched her best-selling book of the same name. Through the Earth Diet lifestyle, she has helped thousands of people with thyroid issues, eating disorders, cancer, diabetes, acne, addictions, and other afflictions. Liana kept hearing from readers and clients that their biggest obstacle was a lack of time, so she gathered together her favorite quick recipes and time-saving techniques. 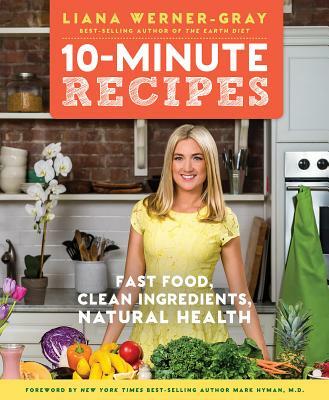 In 10-Minute Recipes, you will find more than 100 recipes to get into your diet more of the essential vitamins, minerals, and micronutrients your body needs—each of which can be prepared in 10 minutes or less. Whether you’re a meat eater or a raw vegan, this inclusive book offers options for juices, smoothies, salads, entrees, desserts, and more that will delight any palate. Liana also delivers advice on proper nutrition; tips for shifting out of toxic habits; and guides for specific goals such as weight loss, reducing inflammation, and increasing energy.